A drawing of a graph or network diagram is a pictorial representation of the vertices and edges of a graph. This drawing should not be confused with the graph itself: very different layouts can correspond to the same graph. In the abstract, all that matters is which pairs of vertices are connected by edges. In the concrete, however, the arrangement of these vertices and edges within a drawing affects its understandability, usability, fabrication cost, and aesthetics. The problem gets worse if the graph changes over time by adding and deleting edges (dynamic graph drawing) and the goal is to preserve the user's mental map. Graphs are frequently drawn as node–link diagrams in which the vertices are represented as disks, boxes, or textual labels and the edges are represented as line segments, polylines, or curves in the Euclidean plane. Node–link diagrams can be traced back to the 13th century work of Ramon Llull, who drew diagrams of this type for complete graphs in order to analyze all pairwise combinations among sets of metaphysical concepts. Alternative conventions to node–link diagrams include adjacency representations such as circle packings, in which vertices are represented by disjoint regions in the plane and edges are represented by adjacencies between regions; intersection representations in which vertices are represented by non-disjoint geometric objects and edges are represented by their intersections; visibility representations in which vertices are represented by regions in the plane and edges are represented by regions that have an unobstructed line of sight to each other; confluent drawings, in which edges are represented as smooth curves within mathematical train tracks; fabrics, in which nodes are represented as horizontal lines and edges as vertical lines; and visualizations of the adjacency matrix of the graph. graph-tool, a free/libre Python library for analysis of graphs. 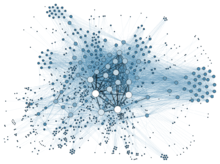 NetworkX is a Python library for studying graphs and networks. ^ Di Battista et al. (1994), pp. vii–viii; Herman, Melançon & Marshall (2000), Section 1.1, "Typical Application Areas". ^ a b Di Battista et al. (1994), p. 6. ^ a b Di Battista et al. (1994), p. viii. ^ Knuth, Donald E. (2013), "Two thousand years of combinatorics", in Wilson, Robin; Watkins, John J., Combinatorics: Ancient and Modern, Oxford University Press, pp. 7–37 . ^ Holten & van Wijk (2009); Holten et al. (2011). ^ Garg & Tamassia (1995). ^ a b Longabaugh (2012). ^ Di Battista et al. (1994), Section 2.1.2, Aesthetics, pp. 14–16; Purchase, Cohen & James (1997). ^ Di Battista et al. (1994), p 14. ^ Di Battista et al. (1994), p. 16. ^ a b Pach & Sharir (2009). ^ Published in Grandjean, Martin (2014). "La connaissance est un réseau". Les Cahiers du Numérique. 10 (3): 37–54. doi:10.3166/lcn.10.3.37-54. Retrieved 2014-10-15. ^ Di Battista et al. (1994), Section 2.7, "The Force-Directed Approach", pp. 29–30, and Chapter 10, "Force-Directed Methods", pp. 303–326. ^ Beckman (1994); Koren (2005). ^ Di Battista et al. (1994), Chapter 5, "Flow and Orthogonal Drawings", pp. 137–170; (Eiglsperger, Fekete & Klau 2001). ^ Herman, Melançon & Marshall (2000), Section 2.2, "Traditional Layout – An Overview". ^ Sugiyama, Tagawa & Toda (1981); Bastert & Matuszewski (2001); Di Battista et al. (1994), Chapter 9, "Layered Drawings of Digraphs", pp. 265–302. ^ Doğrusöz, Madden & Madden (1997). ^ Di Battista et al. (1994), Section 4.7, "Dominance Drawings", pp. 112–127. ^ Scott (2000); Brandes, Freeman & Wagner (2014). ^ Di Battista et al. (1994), pp. 15-16, and Chapter 6, "Flow and Upward Planarity", pp. 171–214; Freese (2004). ^ Anderson & Head (2006). ^ Di Battista & Rimondini (2014). ^ Bachmaier, Brandes & Schreiber (2014). ^ "Graphviz and Dynagraph – Static and Dynamic Graph Drawing Tools", by John Ellson, Emden R. Gansner, Eleftherios Koutsofios, Stephen C. North, and Gordon Woodhull, in Jünger & Mutzel (2004). ^ Nachmanson, Robertson & Lee (2008). ^ Madden et al. (1996). 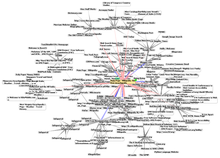 ^ "Tulip – A Huge Graph Visualization Framework", by David Auber, in Jünger & Mutzel (2004). ^ "yFiles – Visualization and Automatic Layout of Graphs", by Roland Wiese, Markus Eiglsperger, and Michael Kaufmann, in Jünger & Mutzel (2004). Di Battista, Giuseppe; Eades, Peter; Tamassia, Roberto; Tollis, Ioannis G. (1994), "Algorithms for Drawing Graphs: an Annotated Bibliography", Computational Geometry: Theory and Applications, 4 (5): 235–282, doi:10.1016/0925-7721(94)00014-x . Kaufmann, Michael; Wagner, Dorothea, eds. (2001), Drawing Graphs: Methods and Models, Lecture Notes in Computer Science, 2025, Springer-Verlag, doi:10.1007/3-540-44969-8, ISBN 978-3-540-42062-0 . Bastert, Oliver; Matuszewski, Christian (2001), "Layered drawings of digraphs", in Kaufmann, Michael; Wagner, Dorothea, Drawing Graphs: Methods and Models, Lecture Notes in Computer Science, 2025, Springer-Verlag, pp. 87–120, doi:10.1007/3-540-44969-8_5, ISBN 978-3-540-42062-0 . Doğrusöz, Uğur; Madden, Brendan; Madden, Patrick (1997), "Circular layout in the Graph Layout toolkit", in North, Stephen, Symposium on Graph Drawing, GD '96 Berkeley, California, USA, September 18–20, 1996, Proceedings, Lecture Notes in Computer Science, 1190, Springer-Verlag, pp. 92–100, doi:10.1007/3-540-62495-3_40, ISBN 978-3-540-62495-0 . Eiglsperger, Markus; Fekete, Sándor; Klau, Gunnar (2001), "Orthogonal graph drawing", in Kaufmann, Michael; Wagner, Dorothea, Drawing Graphs, Lecture Notes in Computer Science, 2025, Springer Berlin / Heidelberg, pp. 121–171, doi:10.1007/3-540-44969-8_6, ISBN 978-3-540-42062-0 . Freese, Ralph (2004), "Automated lattice drawing", in Eklund, Peter, Concept Lattices: Second International Conference on Formal Concept Analysis, ICFCA 2004, Sydney, Australia, February 23-26, 2004, Proceedings (PDF), Lecture Notes in Computer Science, 2961, Springer-Verlag, pp. 589–590, CiteSeerX 10.1.1.69.6245, doi:10.1007/978-3-540-24651-0_12, ISBN 978-3-540-21043-6 . Garg, Ashim; Tamassia, Roberto (1995), "Upward planarity testing", Order, 12 (2): 109–133, CiteSeerX 10.1.1.10.2237, doi:10.1007/BF01108622, MR 1354797 . Holten, Danny; Isenberg, Petra; van Wijk, Jarke J.; Fekete, Jean-Daniel (2011), "An extended evaluation of the readability of tapered, animated, and textured directed-edge representations in node-link graphs", IEEE Pacific Visualization Symposium (PacificVis 2011) (PDF), pp. 195–202, doi:10.1109/PACIFICVIS.2011.5742390, ISBN 978-1-61284-935-5 . Holten, Danny; van Wijk, Jarke J. (2009), "A user study on visualizing directed edges in graphs", Proceedings of the 27th International Conference on Human Factors in Computing Systems (CHI '09) (PDF), pp. 2299–2308, CiteSeerX 10.1.1.212.5461, doi:10.1145/1518701.1519054, ISBN 9781605582467, archived from the original (PDF) on 2011-11-06 . Koren, Yehuda (2005), "Drawing graphs by eigenvectors: theory and practice" (PDF), Computers & Mathematics with Applications, 49 (11–12): 1867–1888, doi:10.1016/j.camwa.2004.08.015, MR 2154691 . Longabaugh, William (2012), "Combing the hairball with BioFabric: a new approach for visualization of large networks" (PDF), BMC Bioinformatics, 13: 275, doi:10.1186/1471-2105-13-275, PMC 3574047, PMID 23102059 . Madden, Brendan; Madden, Patrick; Powers, Steve; Himsolt, Michael (1996), "Portable graph layout and editing", in Brandenburg, Franz J., Graph Drawing: Symposium on Graph Drawing, GD '95, Passau, Germany, September 20–22, 1995, Proceedings, Lecture Notes in Computer Science, 1027, Springer-Verlag, pp. 385–395, doi:10.1007/BFb0021822, ISBN 978-3-540-60723-6 . Nachmanson, Lev; Robertson, George; Lee, Bongshin (2008), "Drawing Graphs with GLEE" (PDF), in Hong, Seok-Hee; Nishizeki, Takao; Quan, Wu, Graph Drawing, 15th International Symposium, GD 2007, Sydney, Australia, September 24–26, 2007, Revised Papers, Lecture Notes in Computer Science, 4875, Springer-Verlag, pp. 389–394, doi:10.1007/978-3-540-77537-9_38, ISBN 978-3-540-77536-2 . Saaty, Thomas L. (1964), "The minimum number of intersections in complete graphs", Proc. Natl. Acad. Sci. U.S.A., 52 (3): 688–690, doi:10.1073/pnas.52.3.688, PMC 300329, PMID 16591215 . Graph drawing at Curlie for many additional links related to graph drawing. This page was last edited on 7 March 2019, at 17:35 (UTC).